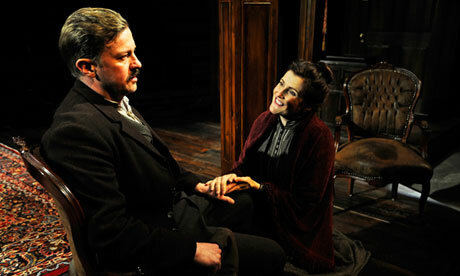 A remarkable play with a remarkable history, Githa Sowerby’s ‘Rutherford and Son’ has opened at St James Theatre. First produced in 1912 at the Royal Court Theatre, its authorship was accredited to KG Sowerby, in order to conceal the playwright’s gender. Although a number of women playwrights were coming to the fore at the beginning of the 20th century, perhaps the best known being Cicely Hamilton, it was still unusual to say the least! At a time when women of reasonably well to do backgrounds were expected to do little but sit, be dainty and bear children, the discovery of Sowerby’s identity caused a media flurry of astonishment that a woman could write something so gritty and powerful. The direction of this production (Jonathan Miller) is at times a little too static, especially for a modern theatre without a proscenium arch. Nonetheless, this is an intense, relentless and gripping piece with levels of tension drawing the audience ever closer into the oppressive dining room of a cold and cold-hearted big house on the cold wintry moors. The expository at the beginning of the play is a touch too self-conscious and long, but this otherwise well-constructed work still manages to enthral and shock even modern-day audiences, in a style reminiscent of Greek-tragedy depicting a family dictatorship headed for self-destruction. Barrie Rutter, artistic director of the company and leading man of the production, is utterly convincing as the overbearing, yet wily bully of the family, cruel in his truthfulness and ruthless in his accurate assessments of both people and business. And yet, our sympathies for this character are still sometimes invoked. There are moments in the script where surprising acts of past fairness are revealed and unpleasant or not, we are forced to face the truths he speaks so plainly. Other standout performances were by Sara Poyzer as Janet, 35 year old spinster daughter of the house, as brutally honest as her father in her own way, longing for love and desperate to escape the oppression in which her manufactured gentility has imprisoned her; Catherine Kinsella as Mary, whose gentle manner belies the tough realism causing her to strike the unspeakable bargain, and Kate Anthony as the embittered old Aunt Ann, still fiercely wielding her domestic power over the other women in the house, and whose accent sounded the most authentic. Richard Standing provides good contrast too as the over-awed long-standing foreman at Rutherford’s glassworks, the failing family business. Yorkshire based company Northern Broadsides are known for taking classical works and re-setting them in Yorkshire. Rutherford and Son was originally set in Tyneside with its own idiosyncratic idiom. Rutter neverthess decided to have it re-worked to create a more generally Northern piece, peppered with specifically Yorkshire vocabulary. Strangely though, much of the dialogue still has a distinctly Geordie rhythm to it, and some of the more archaic language aside, it would be interesting to hear it in the original form. It is not an easy night out, but this compelling and exceptional work deserves to be seen, and appropriately the St James Studio will be staging a one-woman piece, ‘Githa’, on the playwright later in the month as part of its play season. 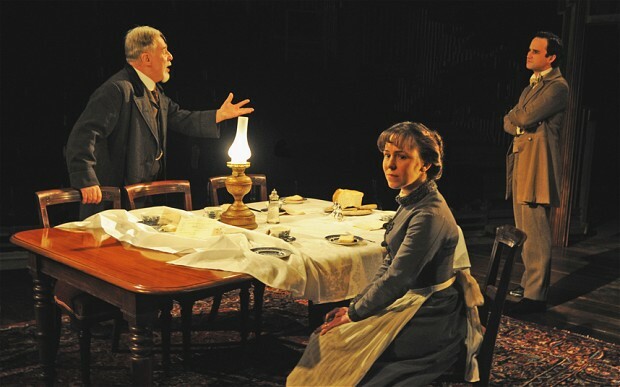 This entry was posted in Theatre Reviews and tagged Barrie Rutter, Catherine Kinsella, fiona jane weston, Githa, Githa Sowerby, Jonathan Miller, Kate Anthony, London theatre, Nicholas Shaw, Northern Broadsides, Richard Standing, Royal Court Theatre, Rutherford and Son, Rutherford and Son review, Sara Poyzer, St james Studio, theatre reviews. Bookmark the permalink.